Box office – via Volterrana 306/308, località La Sterza, in front of the restaurant “Da Pasquino” – Lajatico. The holders of the Vivaticket voucher, that didn’t request the shipment of tickets at home at tds@citysoundmilano.com, have to convert it with the entrance ticket for the show exhibiting the purchase order and a valid ID at the box office, which will be specially set up in Lajatico at La Sterza, via Volterrana 1, in front of the restaurant “Da Pasquino”. We remind you that this operation is essential to enter at the theatre! For security reasons and to protect physical integrity, if you are pregnant or injured, you should not attend the event, in case, pregnant woman or injured persons decide to be present at event, we would like to advise that they will be doing so at their own risk, without any liability on part of City Sound. All those who have purchased an Executive ticket, to access the parking reserved to them (Executive Parking), have to drive to the La Mandriola road exiting the state highway 439 (see map attached). La Mandriola road will be supervised by our control service which will allow the transit to all those who will show the executive ticket and bracelet. The Executive Parking is at the end of the Mandriola road (about 1,5 km). Our staff will coordinate and make parking easier for all the cars allowed in this area. The same procedure is applied to all the cars with driver and the vans carrying clients with executive tickets. The access will not be allowed to buses. 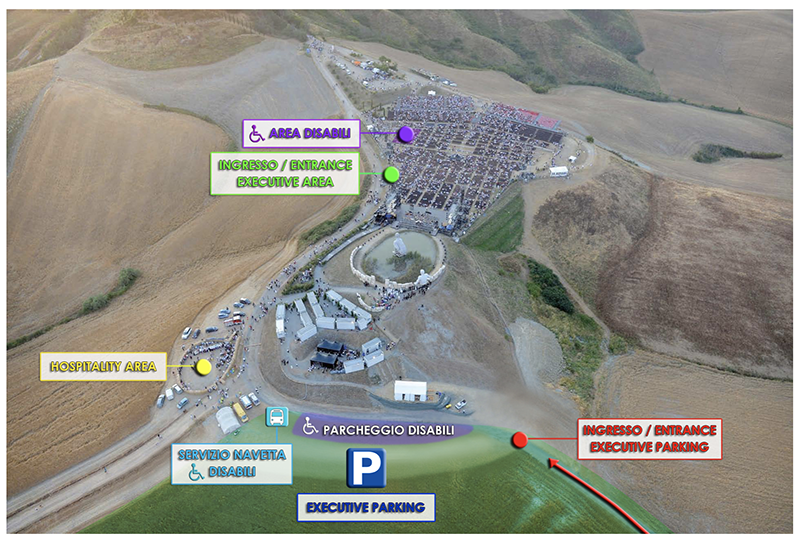 Access to La Mandriola will be allowed from 5:00pm on Thursday 25th and Saturday 27th July 2019. .
Option 1: park your car in the parking lot set up in La Sterza and use the free shuttle buses provided by us. The distance from the shuttle stop to the entrance of the Theatre is about 500 mt. Shuttle buses will be available also for the return at the end of the show. In the parking of La Sterza you can park since the morning, while the shuttle bus service will operate from 5:00 pm. Option 2: take the state highway 439 and take the San Giovanni road to Lajatico, which will be duly marked, follow the signs for the parking POGGIO AL LUPO situated in the hill below the Teatro. The cost is 2 euros. The distance from the parking to the entrance of Theatre is about 300mt. The parking is open from 5:00 pm and is equipped with refreshment services and toilets. 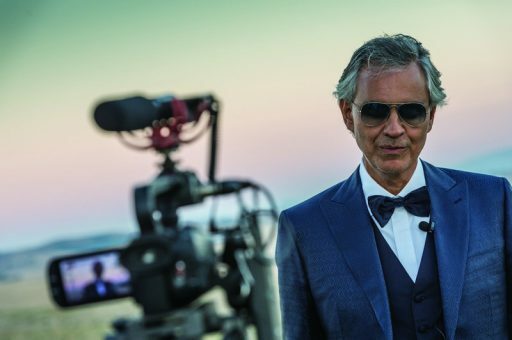 N.B: If you do not know how to reach the Teatro del Silenzio you can contact our partner Eventi in Bus that for the occasion organizes bus transfer from all the main cities in Tuscany. BUSES: Tourist buses with up to 54 seats with two axles will be allowed to park at the sports field in Lajatico meanwhile those with three axles are only allowed to park at the parking lot set up in LA STERZA and use the free shuttle buses provided by the organization. The distance from the shuttle stop to the Theater entrance is about 500 meters. Driving the state highway 439 the entrance to La Mandriola road will be duly marked. At the checkpoint, they will have to show the ticket and the confirmation mail received from City Sound that confirms the reservation in the area of the Teatro dedicated to them. From the EXECUTIVE parking, Disabled persons will be transported by a vehicle provided by us to the area reserved for them. Disabled persons will have access to La Mandriola starting from 5.00 pm.